Karnataka Chief Minister Siddaramaiah initially brushed aside the charge, telling reporters that "Amit Shah has no brain it seems. He is a brainless man." Karnataka Chief Minister Siddaramaiah mocked Amit Shah and state BJP chief BS Yeddyurappa on Twitter. 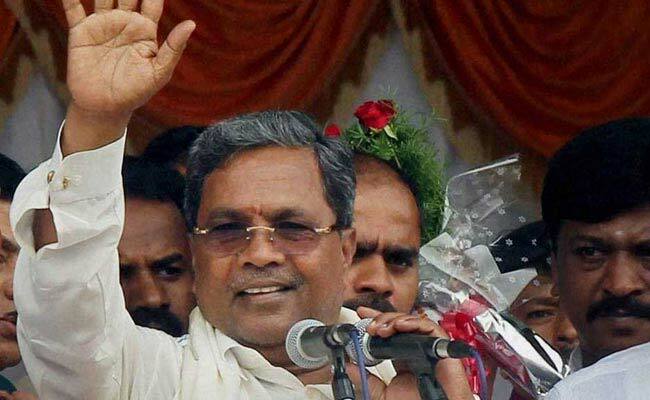 Siddaramaiah calls Amit Shah "brainless man" and "ex-jailbird"
Just a day after BJP president Amit Shah set the tone for assembly elections in Karnataka with his sharp criticism of the Karnataka Congress, Chief Minister Siddaramaiah hit back at the BJP's top strategist calling him a "brainless man" and an "ex-jail bird". Mr Siddaramaiah's comeback to the BJP president accusing him of corruption, however, triggered a storm of attacks from BJP leaders who kept the punches coming till late on Friday evening. Of the many accusations that Mr Shah had levelled at the Chief Minister from his rally in Mysuru on Thursday was about his personal integrity. "The Siddaramaiah government has crossed all limits of corruption. In Karnataka, Siddaramaiah and corruption are synonyms. Siddaramaiah means corruption and corruption means Siddaramaiah," Mr Shah had said at his rally. The Chief Minister initially brushed aside the charge, telling reporters that "Amit Shah has no brain it seems. He is a brainless man." Mr Siddaramaiah later decided to respond to him on Twitter as well and picked up the post where Mr Shah had levelled the "Siddaramaiah means corruption" charge. "Says an ex-jail bird who chose another former jail bird to be his party's CM candidate for our Karnataka election," tweeted Mr Siddaramaiah mocking Mr Shah and the BJP's presumptive chief minister BS Yeddyurappa. He also demanded that they come up with proof to back up the charge. Mr Shah had spent three months in jail in 2010 on charges of conspiring to kill Sohrabuddin Sheikh in the 2005 fake encounter case. In December 2014, a court, however, said the CBI had not produced enough evidence to prosecute him and closed the case. Mr Yeddyurappa, on the other hand, had to quit as Chief Minister after an anti-corruption panel indicted him for a mining scandal. He had later spent three weeks in jail, also as an undertrial, but was later cleared in this case. "So says a CM who destroyed Lokayukta, misused ACB (Anti-corruption department) and CID (Criminal Investigation Department) and give himself a clean chit in dozens of corruption charge and complaints against him," Mr Yeddyurappa tweeted, also reminding the Chief Minister that "we are acquitted of all the false cases filed against us". The BJP leader added: "Lest you forget in National Herald case Sonia Gandhi and Rahul Gandhi - who are on bail now - will be 'Jail Birds' soon." Union Minister Sadanand Gowda chipped in with more, recalling that Indira Gandhi who had formed the Congress (I) in 1969 too had been arrested, in 1977. Her son, Union Minister Gowda said, would have served a jail term in the Bofors scam, if not for his assassination. "Need more list sir?" Mr Gowda said.